Why Do You Need a Dress Block? Why do I need a Dress Block? Can't I just re-design a purchased pattern? 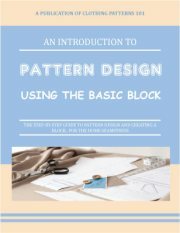 In this video, I'll tell you about the Flat Pattern method of pattern design (which is what we use at ClothingPatterns101), and about the importance of the basic block. In the video above, I reference pages on the website that offer more information. Time to get started on your dress block, whether you use a commercial pattern or draft it yourself! Why do I need a Dress Block? Can't I just re-design a purchased pattern? Why do I need Darts? They're so UGLY!! What does it mean to "true" your pattern? Do you have comments or questions about what you just read? Leave me a comment in the box below. Get this site in e-book format! 175 pages - Only $5.97! Don't make the same mistakes I did - do a thorough job of fitting your block so you don't have to make the same corrections over and over! 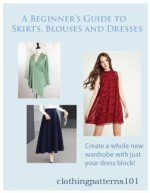 Learn to design dozens of skirts, blouses and dresses using your dress block. What does it mean to "true" your pattern? Truing your pattern means to "make it true", or complete and correct. Add notches, markings, and seam allowances to finish your pattern properly. Watch videos that demonstrate the techniques you'll use to design your patterns. And get tips to make the process easier! Videos are added periodically, so keep checking back! What Does it Mean to "True your Pattern? Why Do I Need Darts? They're so UGLY!